- Use a bowl to cream together the sugars and butter. Making a healthy dessert is very important to me. 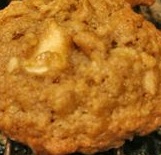 This apple cookie recipe is perfect for my kids. I'll usually make these delicious cookies twice a month for dessert. If you haven't used apples, I highly recommend it.